Camping is a great way to enjoy the great outdoors. If you are new to camping, the first thing you should do is familiarize yourself with camping basics including the must-have gear to start out on this adventure. To start out, you'll need to have some sort of shelter—usually a tent, but a cabin, RV, or even your van or truck can provide comforts while camping. Second, you'll need something to sleep on—sleeping bag and pad, a cot or air mattress, and blankets or comforters. Once you decide on your shelter and sleeping situation, think about eating, which may or may not require cooking utensils. Put together your own camping starter kit with some tried and true tips and advice for the first-timer. First-time campers usually start out as tent campers. 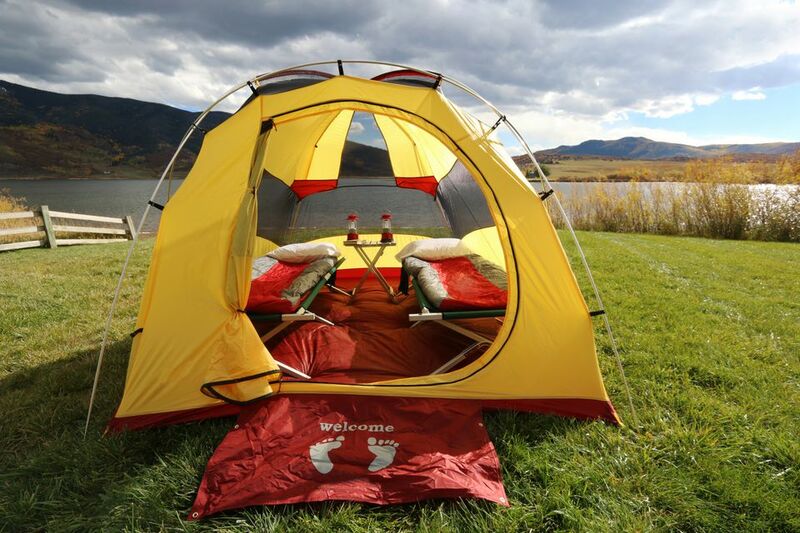 Your first tent need not be expensive, but it should provide adequate weather protection. And, the tent should be large enough so that the campers do not feel crowded and there will be room for gear. Most sizes will fit in a car trunk. For family camping, it is recommended that the tent have a capacity rated two higher than the number of campers that will use it. So a family of four would want a tent rated for six people. There are many quality tents available in the $100-$200 price range. There are many factors to consider in choosing a tent including finding one with aluminum poles and a good rain fly to protect the entrance, ensuring that the design will protect you from the rain. Then you'll need to select a tent with quality components like tight seams, strong zippers, well-attached guy lines, and cloth stake loops. While you may think sleeping out under the stars would be fun, do consider a tent. A tent shields you from the wind, sun, and rain, and protects you from unfriendly outdoor pests like flies and mosquitoes. A tent also provides a place to store clothes and other gear out of the weather, and offers you a place to go for a little privacy. Making a bed at the campground is easy. First, you need to have some type of padding to cushion you from the hard ground. There are inflatable pads and various closed-cell pads that work quite well. On top of the pad, you'll place your sleeping bag. If you're a beginner, you're probably summer camping, so you won't need an expensive sleeping bag rated for cold weather. A lightweight rectangular sleeping bag will do. Consider a liner to keep your bag clean and extend its life. If it gets too warm, you may opt to sleep on top of it with a sheet and/or blanket. Don't forget to bring a pillow. For those who want to get cozy, look for two sleeping bags that can be zipped together. Whether or not to purchase a cot is an individual decision. If you have trouble getting up and down to the ground, you might consider one. Basics for outdoor cooking range from the simple—a cooler, water container, and barbecue spatula—to gear for the outdoor chef—a propane stove, pots and pans, and your favorite collection of spices. You can always get by with a cooler of drinks, sandwiches, and snacks. Most public campgrounds provide a grill and picnic table at each campsite. With a bag of charcoal, matches, and a spatula you're ready to cook steaks, hot dogs, and hamburgers on the grill. Always have a container of water on hand for drinking and for dousing the fire. If you want to get a bit more elaborate, bring a small propane stove, a skillet, and a few pots, and you're ready to cook up lots of stove-top meals. Get a Dutch oven, build a good campfire, and you can bake at the campground too. Don't forget some plastic tubs for washing up. For some great meal ideas, bone up on camping recipes and consider some camper-friendly foods that will make prep easy. When shopping for camping gear, check out big-box discount stores. They have the best prices. Next, visit your local sporting goods store, where you can usually check out tents that are set up on the display floor. Get in them, lay down, and ask yourself if they are roomy enough. Camping gear can also be purchased from major online retailers once you know what you want. If you are not sure how you will like camping, consider renting gear or borrowing from family and friends. A camping checklist will help you remember essential items, like a can opener or your toothbrush. Make a packing list of camping and backpacking gear and refer to it every time you go camping. Revise it as needed, and after you've enjoyed your first camping experience, keep that essential gear in plastic storage bins so that you can just grab and go when you pack for your next trip.